At a time when it has been widely published that Rupert Murdoch and News Corp spent £60 million pounds defending the legal fall out from the phone hacking scandal, it is becoming increasingly apparent that many decisions affecting planning, heritage and the care of museum collections which ethics dictate are held in trust as repositories for the future are being made at the extreme edge of the Law and in a number of documented cases may actually be unlawful. However, the unwillingness of regulatory and Government bodies to intervene and the sheer cost of legal intervention on the part of concerned community groups and individuals means that the checks and balances which the Law supposedly provides to prevent the abuse of culture, heritage and the historic environment are never engaged. The result is loss or damage to local and in some cases national heritage and a series of potentially dangerous precedents which place even more of the cultural reservoir of the UK under threat of commercial exploitation for short-term gain. The sale of twenty-four of the most valuable pieces from the Riesco Porcelain Collection by the former Conservative administration of Croydon Council in 2013. In the cases of both the Riesco Porcelain and the “City of Adelaide”, clear legal opinion existed which demonstrated that there were questions in Law which should have been addressed by the Courts through Judicial Review. “Leading Counsel has advised that with reference to the policy as detailed in the Part A report the decision to sell items from the Riesco Collection may well contravene the Policy; and the decision to use the proceeds of sale for purposes other than ‘for the benefit of the collections’ would be in clear contravention of the Policy. However, in spite of intense criticism from the Arts Council, other museum and cultural bodies including the Museums Association and a vocal grass roots campaign articulated in the local news media, protesters were unable to raise the funds, estimated at in the region of £20,000 to take the case to Law, with the result the pieces were sold at Christie’s in Hong Kong in November 2013. However, because the campaigners were unable to take the opinion to judicial review to test or enforce Mr Harwood’s opinion, the Arts Council, Her Majesties Revenue and Customs which enforce export regulations and Heritage Minister Ed Vaizey, all declined to intervene while their own lawyers reviewed the case. Because the UK authorities declined to intervene, claiming the export was lawful, the Dutch Authorities also declined to stay the export. 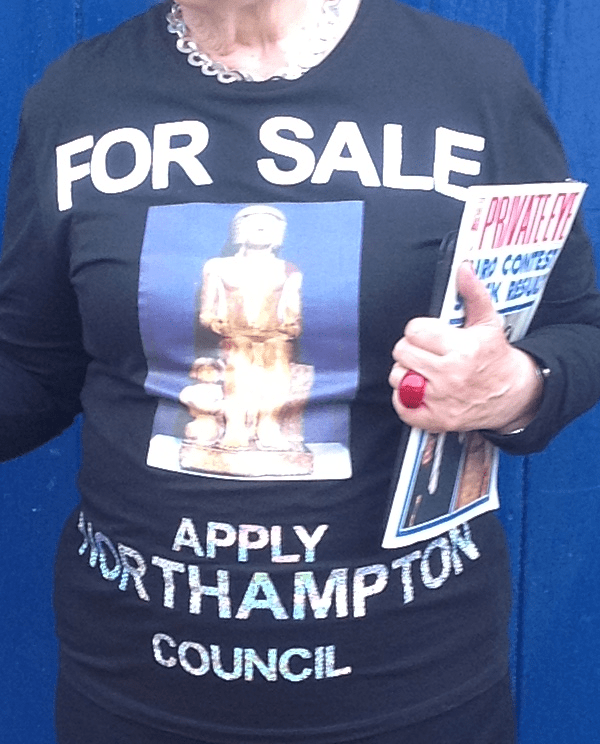 In Northampton, the issue is one of ethics and transparency in the use of public funds as well as museum policy. The Council and the Marquess of Northampton have cited “commercial confidentiality” in refusing to release any information about the legal opinions and agreements between the two parties which they say circumvent the Deed of Gift awarding the Statue of Sekhemka to Northampton Museum, which was granted by an earlier Marquess of Northampton in the 19th century. This is in spite of the deal potentially resulting in a cash windfall to the Marquis of over £6 million pounds. Indeed, as a marker of the public funds already committed information released under the Freedom of Information Act shows that up to 12 May 2014, Northampton Council had already spent £44,191.04 to facilitate the sale. The fact that the Council have also reached an agreement with the Marquess to carry all the costs of the auction and to give the Marquess 45% of the proceeds of the sale, suggests to some legal observers that the two parties have recognised that determining the precise legal status of the statue and thus ascertain who actually has title to sell, would result in additional legal costs and a delay. As a result it is argued the parties have agreed a legal fix to permit the sale to take place to the benefit of both the Marquess and the Council [though arguably not the Council Tax payers of Northampton]. That these decisions, with their profound implications for heritage protection, were not reviewed and tested by the legal system is down to one thing alone, money. At current prices a notice of proceedings by means of a Solicitor’s letter costs approximately £200. A QC’s opinion on a point of Law costs in the region of £2000 and bringing a case to judicial review costs £20,000 and upwards, to all of which can be added VAT at 20% and the risk of incurring a substantial portion of the opponents costs in the event of the case failing. With costs like that, even if a case can be built it is a formidable task and the kind of local authorities, property developers and commercial auction houses which tend to have thin skins as regards criticism and deep pockets full of other people’s money with which to play the legal system and steamroller even well founded challenges. The issue is not just one of museum ethics. By playing in the commercial Art and Antiquities Auction Casino the amateur dealers of the local authorities who seek to cash in on their museum and gallery collections are entering one of the most hard nosed and professional commercial operations in the world. It is debatable whether a 10-15% sellers fee plus other costs and taxes is a good use of public money, especially in cases such as the Riesco sale where the council was reported as hoping to make as much as £13 million and in fact only made £8.24 million, a million pounds short of even Christie’s own estimate, with seven of the objects failing even to reach their reserve. Of course the world record selling price for an Egyptian work of Art of £15.76 million achieved in the sale of the statue of Sekhemka may tempt others to try their luck, but even here the financial benefits are not so clear cut. Taxes, fees and not least the 45% of the proceeds going to the Marquis of Northampton mean that Northampton Council will almost certainly have less than half that figure available to actually spend. It is also the case that should accreditation be lost as a result of the sale of Sekhemka the short term cash wind fall will be outweighed by the longer term loss of grants and charitable donations. Hitherto it has been a comfortable assumption, embodied in the Museum Association’s code of ethics, that our museums should be regarded as cultural capsules, held for the public good and existing outside of most day to day economic concerns. However, the high profile cases of the Riesco Porcelain in Croydon and Sekhemka in Northampton, as well as a number of other museum sales or proposed museum sales, have shown that to some local politicians and administrators at least, museum shelves are stacked not with priceless learning and culture held in trust for the community and the future, but are in fact supermarkets full of high end merchandise to be disposed of to the highest bidder. Until legal action becomes more affordable; the regulatory bodies such as English Heritage, the Museums Association, and the Arts Council step up to the plate and begin to challenge those who break the law over cultural issues; or a powerful and well funded pressure group for the Arts and Culture is set up so as to be capable of challenging alleged polluters of cultural ethics in the same way Friends of the Earth and Green Peace take on environmental polluters; the Auction House check outs are likely to keep on bleeping in the great cultural cash and carry.